Disclaimer: I’m affiliated with the product covered today, so it gets no rating. 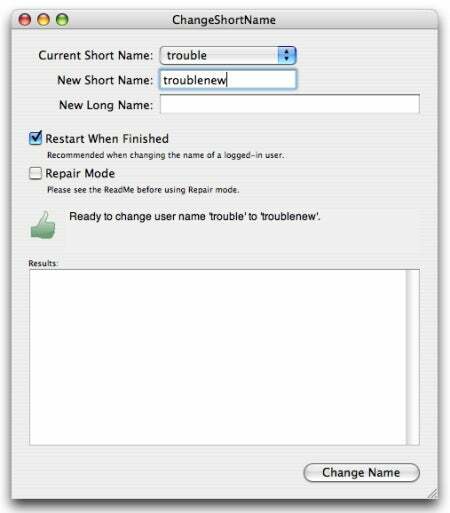 One of the most frequent questions I get from users of Mac OS X is “How do I change my short username?” The question usually comes from people who chose a particular short username when they first started up their Mac under OS X but later decided that they wanted something different. It’s also common among those who’ve come into possession of a Mac previously owned by someone else—they’d rather have their own username than the previous owner’s. I get this question so often because there doesn’t appear to be a way to make such a change. Apple makes it very easy to change your long username—generally your full name—via the Accounts pane of System Preferences. But if you try to change your short username—your official account name in Mac OS X, most easily identifiable as the name of your home user folder in /Users—you’ll find that field to be grayed out and inaccessible. There are good reasons Apple has made it difficult to change your short user name, the most important being that as your official Unix account name, changing it involves more than just typing a new name in a field; it requires changes in a number of low-level places and modifications of a number of important files throughout the operating system. Apple provides a set of instructions for changing a short username; however, what those instructions are really doing is creating a new account, transferring your files from the existing account to the new one, and then deleting the existing account. This approach mostly works, but it’s a bit of a pain and it’s not really complete—a number of settings may not get updated this way. As a result, I often recommend that people simply live with their current short username or, if the account was just created, create another new account with the desired name and then delete the unwanted one. But if you’re determined to actually change the short name of your account, I humbly suggest using ChangeShortName 1.3 , which offers major improvements over earlier versions thanks to a lot of hard work by my co-conspirator, James Bucanek. The biggest enhancements are that the current version is a Cocoa application with an easier-to-use interface and that the name-change procedure no longer requires a trip through Terminal; the latter modification should be especially welcome by the command-line-averse. (A shell script is still included separately for IT folks and remote use.) You simply choose the account you want to modify, enter the desired new short username—and, if you like, a new full name—and then click on the Change Name button. After providing an administrator’s username and password, ChangeShortName will do its thing. ChangeShortName provides feedback on the process in its Results box; although most of this text is simply routine log output explaining what’s happening behind the scenes, it also includes some useful information. For example, ChangeShortName searches for, and lists, preferences (.plist) files that include references to your old home directory; as explained in the ReadMe file, such references can lead to unexpected behavior in the associated applications, as the applications may look for their data in the wrong location. You’ll want to launch the offending applications and update their preferences to point to your new user folder (and, while you’re at it, drop their developers a friendly reminder to use relative path names [~/] in their preferences files instead of absolute [/Users/ username /] paths.). Compare this simple process to the one Apple outlines at the link I noted above, and I think you’ll see why we created this app. ChangeShortName includes a number of safety features to help ensure you don’t hose your system, and the new version also now allows you to change the name of an account that includes a hypen (-). That said, allow me to repeat something else I wrote back in 2004: Before you rush off to download ChangeShortName and change all your usernames, a warning is in order. Changing the short username is a serious procedure that involves the modification of system files; because of this, the safest option is to simply learn to live with your present short username. But if you’re determined to change your short username, ChangeShortName is the easiest way to do so. Just be sure to read the ReadMe file that comes with it—that document provides much more information on the procedure and is required reading. 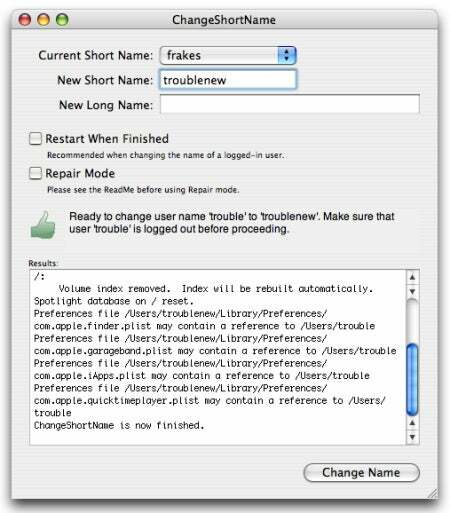 ChangeShortName 1.3 is a Universal binary and works with Mac OS X 10.3 and later. The included Terminal (shell) script can also be used on Mac OS X 10.2.